Traditionally, calves are weaned at six to seven months of age. In typical spring-calving herds in the northern Great Plains, this is usually October or early November. However, there are situations, when early weaning should be considered as a management tool. Early weaning can be used as a management tool to improve or manipulate body condition, especially in young or thin cows. Time of weaning will have impacts on cow and calf performance as well as health and productivity of the native range or pasture. There are several advantages of early weaning. I'll discuss a few in more detail here. •	Improved cow body condition. Lactating cows can lose body condition due to the imbalance which may exist between forage nutrients and the cow's requirements during lactation. When drought conditions exist, this situation is usually made worse by lack of forage in drought-stressed pastures. By weaning early, the cow's nutrient requirements for lactation are eliminated and cows are able to maintain or increase body condition prior to the fall and winter feeding period. Early weaning can be used in conjunction with supplementation to improve cow body condition going into the winter. However, weaning late or failing to provide proper supplementation can result in loss of body condition and thin cows. •	Improved calf performance. In some cases, calves may not be able to successfully compete with cows for adequate forage. By weaning early and providing a highly nutritious diet, calves can reach their growth potential. Early weaning, coupled with feeding a high concentrate diet, has resulted in increased quality grade a slaughter, according to research conducted at several universities. •	Improved conception rates. Weaning early can result in improved conception rates, provided the calves are weaned during the breeding season. This would require weaning calves at a very young age (calves need to be weaned at 45 to 105 days of age to allow increased conception rates). When weaned early enough, cows have a greater opportunity to re-breed in an optimum time frame and an increase in conception rate may be possible. •	Improved forage availability for the cow. Early weaning reduces the cow's dry matter intake and also eliminates the demand on the forage from the calf. Consequently, the cows remaining on the pasture have access to more forage and demands on the pasture are reduced, which can enhance sustainability and forage production in the future. •	Increased attention to management is required. Early weaning requires greater attention to proper health, nutrition and management practices. 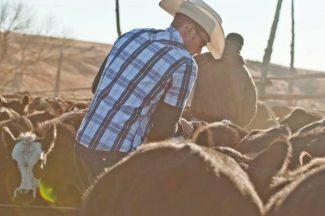 Plans for early weaning should be thoroughly discussed with your veterinarian, nutritionist and ranch personnel so that everyone is prepared. •	Increased labor requirement. Early weaning will require additional labor in order to feed and manage the calves. Be sure your ranch is prepared for the shift in labor requirements. Another option is to ship early weaned calves to a custom feedlot; however, this will add the cash costs incurred. •	Increased facility needs. Beef cattle producers must have facilities to feed calves or hire a custom backgrounder or feedlot to do this work. Be sure the fences, waterers, and feed bunks are sized appropriately for early weaned calves. Waterers and feed bunks which are appropriate for 600-pound calves may not work well for calves weighing 350 pounds. •	Increased cash costs. 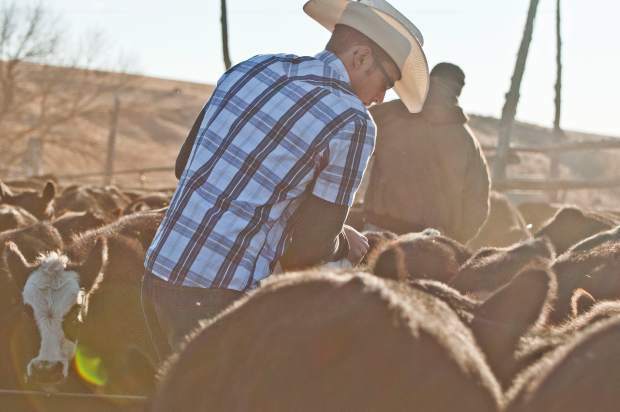 Weaning calves earlier will result in increased cash costs for the rancher or beef cattle producer. Instead of pasture and their mother's milk, early weaned calves will need high quality grains, hays, protein supplements and/or commercially prepared feeds. How early can calves be weaned? Calves have been successfully weaned as early as two months of age. However, this is not practical under most ranch conditions. Weaning March- and April-born calves in late July or early August is generally preferable to earlier time frames. Be sure to work with your veterinarian and nutritionist in advance to plan your vaccination, health, and feeding programs. •	Castrate, dehorn and brand calves 10 to 14 days prior to weaning. •	Vaccinate for clostridial (7-way) and viral (4-way) infections. Work with your local veterinarian to develop a specific program. Follow the label recommendations and re-vaccinate if necessary. Administer all vaccinations in the neck area to avoid injection site blemishes. •	Treat for internal and external parasites. •	Provide protection from flies. •	Provide a good quality trace mineral and vitamin (A, D, E) supplement to all calves. •	Provide access to adequate quantities of good quality, clean water. Clean watering equipment on a regular basis. •	Monitor calves daily for symptoms of respiratory disease, digestive disturbances, scours, coccidiosis and intake level. Place calves in a small, secure, well-sheltered pen or pasture after weaning. If possible, sort calves by weight into smaller pens so that small calves and large calves are not competing for the same feed and water. During extremely dry conditions, dust can become a problem. Consider using sprinklers to control dust in pens if necessary. Heat stress can also be a potential problem. Providing shade is one solution, although it is not easily done in many situations. Refrain from working the calves during the hottest part of the day. Feed intake may also be reduced during periods of heat stress. In these cases, providing a diet with greater concentrations of nutrients may be beneficial. Waterers and feed bunks should be placed along the fence line to allow calves to find feed and water easily. Freshly weaned calves will tend to walk the fence line. Placement of feed and water in the center of the pen make it more difficult to find. Early weaning is one management option which should be considered as a means to manage cow body condition. Early weaning will be more successful and less stressful when adequate attention to nutrition, health, management and facilities is considered. Early weaning provides options for managing a cow herd during periods of short forage supplies and for strategic management of young, thin cows.